Part cake, part bread, these buttery festive Italian treats are flavoured with cinnamon, citrus rinds, ginger and vanilla. Rather than making in one large traditional tall tin, these individual ones are baked in recycled cans and make great Christmas gifts wrapped in cellophane. 1. Melt 200g (7oz) of the butter gently in a saucepan then take off the heat and leave until it feels warm to a fingertip. 2. Add the bread flour, salt, sugar, cinnamon and fruit rinds to the bowl of an electric mixer fitted with a dough hook, or a large bowl. Add the yeast and mix together. 3. Warm the milk in a second saucepan until it feels just warm to a fingertip. Beat the eggs and vanilla together in a bowl then gradually beat in the warm milk. Gradually mix into the dry flour mix and beat for 4-5 minutes. If you don’t have an electric mixer, use a wooden spoon. 4. Gradually trickle in the warm melted butter, beating well after each addition until the mixture is a smooth, glossy and elastic batter. Cover the bowl with a clean tea cloth or cling film and leave in a warm place for 1 hour or until doubled in size. 5. Meanwhile, brush the inside of the washed and recycled cans with a little oil then line the bases with a circle of non-stick baking paper and the sides with a strip of paper that stands a little above the tins. 6. Knock the yeast batter back by beating for 1-2 minutes then stir in the candied fruit and ginger. Add the blueberries and gently stir together so that you don’t break them up. Divide between the lined tins. Cover the tops with a clean tea cloth then leave in a warm place for 1 hour or until the batter almost reaches the tops of the tin. 7. Meanwhile, preheat the oven to 190oC/170oC fan assisted), Gas Mark 5. Remove the cloth from the top of the breads. Bake for 30-35 minutes until a deep brown and the bread sounds hollow when the tops are tapped. Take out of the oven, brush the tops with the remaining butter then cool for a few minutes. 8. 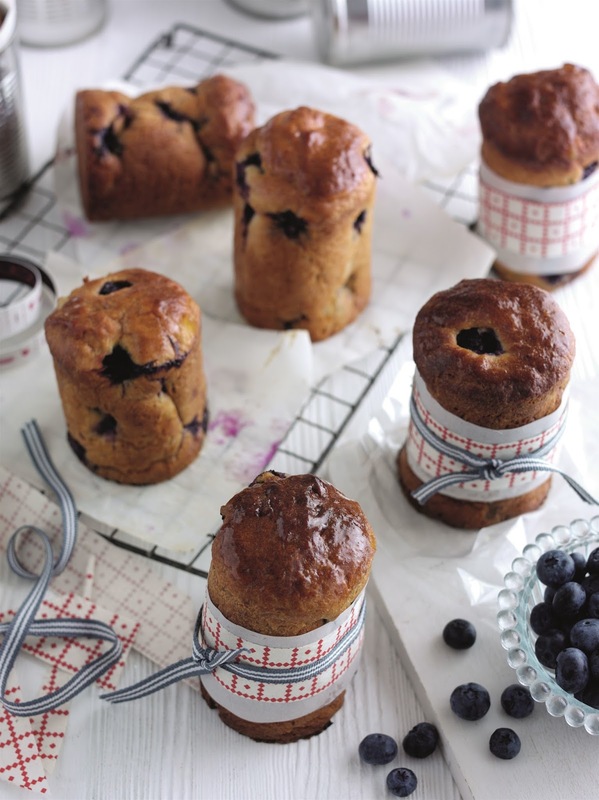 Loosen the edges of the panettone, turn out and leave to cool on their sides on a wire rack. 9. When cold, wrap in clean paper and return to the washed and decorated tins then wrap in cellophane, tie with ribbon and add labels. These can be kept up to 4 days. As these breads contain a generous amount of butter and sugar, you will find that they take longer to rise than plainer breads. Make sure that the liquid is warm to your little finger – too hot and you will kill the yeast, too cool and it will take ages to activate the yeast and start the rising process. 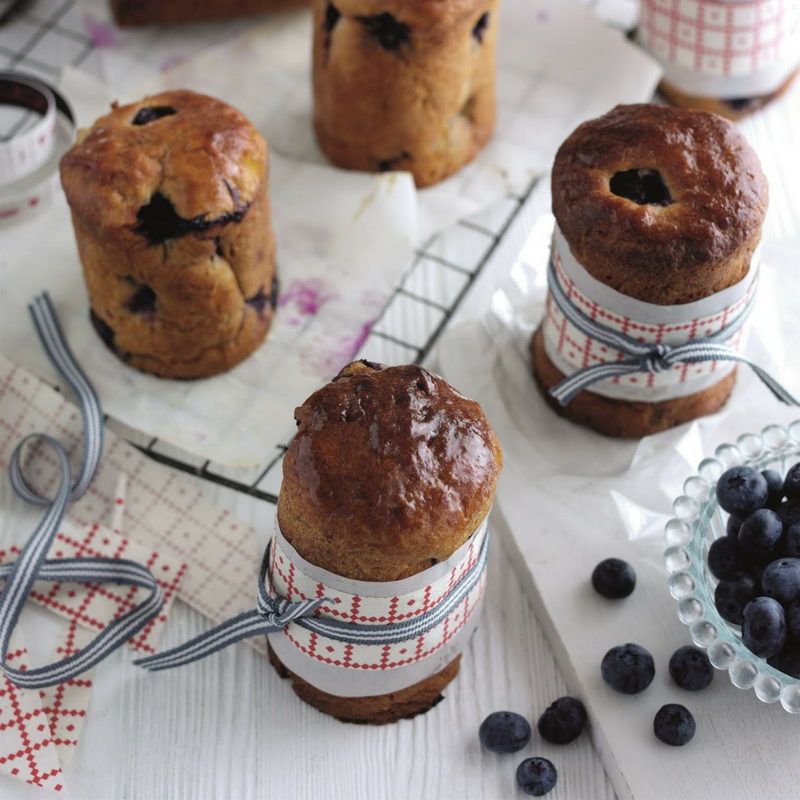 What do you think of this Christmas Spiced Blueberry Panettones recipe? "Strawberries, Peach And Banana Milkshake…"